I’ve never been a huge fan of Chimichurri; the bold, brash taste of the ones I’ve had or recipes I’ve tried always been a bit off-putting to me. But when I was thinking about something to go with my Coffee Rubbed Steak the other day, my mind immediately seized upon Chimichurri. I knew that my Coffee Rubbed Steak, with its own bold flavoring, would be fantastic with a little Chimichurri. And so began the search for a recipe I thought I’d like. And that’s when I came across a fantastic article from Asado Argentina debunking all the common myths and misconceptions about Chimichurri. Including several ones that I had believed. 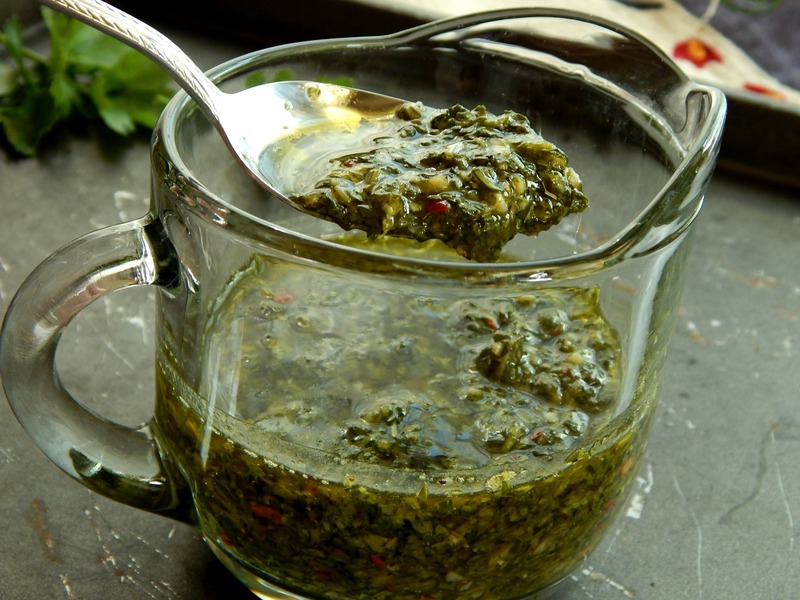 In particular, the article described how Chimichurri is often made in larger batches and then sits until it’s used up. This was an aha moment for me and a bit of a relief. You see, I have found that I like Chimi much better after a few hours and even more after a few days. So I wasn’t nuts after all. Over time, although the Chimichurri does lose some it’s brightness it also loses some of its brashness. The flavors blend and mellow. So of course, now I love my new “old: or maybe I should say slightly aged Chimichurri. And yes it was the perfect thing with that Coffee Rubbed Steak. And it’s going to be the perfect thing for so many things, grilled steaks, and sausages for one, but there are so many other ways to use Chimichurri. When you have a jar of it on hand, you’re only limited by your imagination. First of all, use your Chimichurri for just about anything grilled. Chicken or a fish; maybe Salmon. But think about adding it to your proteins before you cook them, as a fresh and bright marinade. Add some to tahini for a fun dip. Sprinkle it over otherwise dull grains or salads built on grains to brighten them up. A recipe was provided at Asado Argentina and I slightly adapted it just a bit to come up with what I think is the perfect Chimichurri for me. And then, because I made it ahead, I set it aside to age. There’s really nothing at all to making a Chimichurri – it’s just basically a salad dressing, just a very herby one, right? How about you? Do you have your own perfect combo of flavorings? Do you prefer your Chimi bright, green and grassy or “aged” a bit? And do you go with the traditional or do you go wild with ingredients? When you make your Chimichurri, if you don’t already grow your own herbs, really think about growing a few either in your garden or in a pot – generally, a plant isn’t much more than a bunch at the grocery store, and even if you don’t have a green thumb. even if you kill it off, you can still dry it and put it in a jar. There’s not much danger of any loss, there. Chimichurri is a case where you’ll really want to pull out the good olive oil if you have it, and you can choose one with a more neutral flavor to let the herbs shine, but the “mouthfeel” is just better with great olive oil. Use freshly cracked pepper, too. Shop around for the best price on olive oil – you might be surprised at how competitive grocery store prices are and both Aldi and Costco have great pricing, too. If your olive oil is in a big jug, don’t be shy about dividing it into more than one container. One will be your “working” bottle and the other should be stored away in a cool, dark cupboard where it will stay at it’s best for some time. I do try to stock up on all vinegar, in enough quantity to last through the summer months (when I make the most salads) during Easter when vinegar is generally at the lowest price, even though it is usually unadvertised. Combine all ingredients except vinegar, oil and water in a medium bowl, toss well and let stand for 30 minutes. Add vinegar and water and mix well. Allow to stand for 30 minutes. Using a fork, whisk in oil. Make sure all ingredients are covered by about an inch and if not, add water, vinegar, and oil in proportion. Cover, and chill for at least 3 hours or overnight. For best results, allow to sit for at least 2 to 3 days. Bring to room temperature for about an hour before serving; if the olive oil thickens from the cold of the refrigerator it will warm up easily at room temperature and the time out of the fridge will help take the chill of the herbs, intensifying the flavor. Today, of course, I’ll be linking my Chimichurri to our very own Throwback Thursday Link Party, hosted by Quinn of Dad What’s for Dinner, Meaghan of 4 Sons are Us, Alli of Tornadough, Carlee from Cooking with Carlee and Moi! That’s right – me! And, as I do almost every Friday, I’ll be linking up to Angie’s Fiesta Friday – this week is Fiesta Friday 123, co-hosts this week are Margy @ La Petite Casserole and Linda @ La Petite Paniere. This entry was posted in Click here for Fabulous Food Posts and tagged Argentina, Condiments, Latin American, Sauce, Vinegar. Bookmark the permalink. Well thanks, Kris! I think you can put all kinds of things in a Chimichurri so start with a basic (but delicious) one like this and then start experimenting – that’s a great way to go! Thanks! I appreciate the reblog! I’ve never been a huge fan of chimichurri either, but now I am wondering if I’d like it better aged a bit. I have a crop of parsley coming up, I’ll have to give it a go. I may try it with my carrot greens too, I made a pesto last year but think a chimichurri would be fun too! I have never made chimchurri but I like it a lot… it is perfect for summer barbecue! Thanks a lot for being at FF! See, lol, more great taste!! 🙂 Thanks Elaine! I’ve often made chimichurri but have enjoyed within the hour – next time I’ll be making it the day before. Great post – thanks for sharing! When I lived in Kansas, my next door neighbor was from Argentina. He always made a big batch of chimichurri and let it sit and use it as needed for days. He had quite a few strict rules about it though, like not using food processor, no citrus juice, etc. Good grief!! I do have his recipe posted on the old blog, though. Yours is very close to it. See, I have heard of not using the food processor on chimichurri and on a whole lot of things – My food processor is almost always in use for one thing or another! Aruna, how lovely. I have cottage cheese and some of this left in the fridge – might have to give it a go! I was thinking of using it on a pizza! I love chimichurri with steak, your recipe is almost exactly like mine only I use arugula instead of cilantro. Delicious looking steak. I remember seeing that post – I might have to try it – my baby arugula is starting to to come up. Cross your fingers I don’t kill it. We’ve been in the 90’s and I’ve had to drag the hose around to water all our new babies. Next year I might try arugula I love it. It’s been hot here as well. I am going to make this today but realized I only have white wine vinegar instead of red. Perhaps use that with a splash of red wine thrown in? No it’s white wine vinegar, just like red wine but made with white wine instead. So of course, now I’m wondering how it turned out, lol!! My staunch “no sauce on steaks” hubby LOVED the chimichurri sauce. He begrudingly put some on the side and dipped a piece in it, then said “wow this is great!” and then slathered his steak in it! Woo hoo, winner thank you! I’m going to use this on a lot of things now. Wow, it is really, really good! I’m so glad you’re happy about it!! 🙂 Of course I bet your steak is gorgeous! I dumped some of what was leftover on my scrambled eggs this morning! 🙂 Yes nice and charred on the outside and nice and pinkish-red in the middle. I like it better after it’s sat a while. And even if I make just a regular recipe amount, it has to cause there’s just me eating it. At least a week.